Here at A Secure Life, we don’t lean one way or another politically on the issue of gun control. Many people choose to keep a gun in their house in case of home intrusion or other life threatening situations and we feel it is important to learn about gun safety to help keep you and your family safe in your own home. Never leave a gun unattended, even if you are cleaning it, where a child might find it. Always keep your gun locked in a storage location such as a gun safe or lock box. 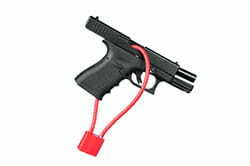 Keep the combination to your gun safe or gun case (or the location of the key) a secret from children. Keep the key to your safe somewhere different from both the safe and the rest of the house keys. Keep toxic cleaning chemicals and materials out of reach of children. Leave guns unloaded when not in use and never leave a loaded gun out to avoid misfirings or accidental shootings. Check to make sure the gun is unloaded before removing it from its secured location to avoid misfirings. Consider keeping only guns that would be used in life-threatening home defense situations (like small handguns) in the home. Keep sporting or range weapons off the premises. One thing we would like to note is that if you ever decide that keeping a gun in the house is no longer the right choice for your family, you can safely and securely dispose of the firearm by contacting your local police station (by calling their non-emergency number). They can help by collecting the gun from your home or having you drop it off at your local police station. They then either have the gun melted down, deactivate it to be used as a training or demonstration tool, or (with your permission) use the active gun in law enforcement training classes. If you have guns in the house, you should be careful to look for any behavioral problems children (especially teenagers) might display such as extreme aggression or depression. These behaviors can indicate that you should not keep guns in the house at all. Not only has the presence of a gun in the home been linked to an increased likelihood of a homicide or accidental death within the home, but also an increased risk of suicide, especially when a child suffers from depression. Up to 85% of suicides that are attempted with a firearm prove fatal. In comparison, many of the other attempted methods by teenages have an average fatality rate of 5%. In fact, victims of suicide are 30 times more likely to use a gun than another form if a gun is kept in the house. Relatedly, if a child exhibits extreme aggression or anger and there is a firearm in the house, there is an increased likelihood that a violent outburst will prove fatal. If you are unsure if your teenager is suffering from depression or other behavioral problem or is simply “being a teenager” don’t be afraid to look for the signs and consult a family doctor. If you suspect your teen may be suicidal and in immediate danger, or you a experiencing these symptoms and feelings yourself, please call 1-800-273-TALK for 24-hour suicide prevention and support if in the U.S. If outside of the U.S., please visit suicide.org to identify your area’s helpline. There are many products available that can help you keep your gun secured at home, out of reach of small children or other unauthorized people (like home intruders). We strongly recommend using more than one of the methods below in addition to the tips outlined above. You certainly don’t want an intruder to be able to gain access to your gun and turn it from a tool for self defense into a threat. Our recommendations below are based upon one sound principle we would like to stress: you should never use concealment of the weapon (under the mattress, in the sock drawer, at the top of the closet, and so forth) as a replacement for a locked, secure storage location. 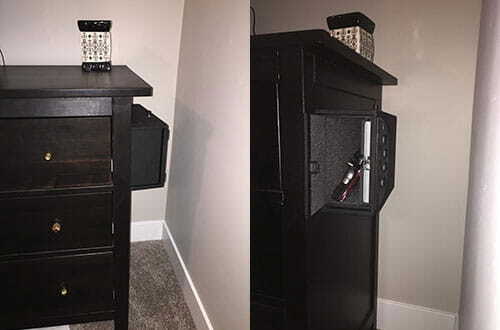 Some gun safes or cases can fit discreetly at the bottom of—or can be built into—a bedside table while others are freestanding and more obvious. The size of the storage option you choose will depend on your personal needs. But there are some general considerations to make when choosing the type of locking mechanism for whatever type of location (a safe, a lock box, a case) you choose. Below we discuss the pros and cons of different kinds of locks. Because of the drawbacks of key locks, specifically that anyone can access the gun if they locate the key, we don’t recommend this as the best option when choosing a locking mechanism. But we certainly recommend it over not locking up your gun at all. Even with the possibility that a code might be forgotten, we feel that safes and lock boxes with combination locks or key codes are a smart and solid option, especially since they allow more than one person to access the gun in times of need while keeping unauthorized individuals out. Even with the drawbacks above we still recommend these kinds of locks as the safest and securest locking mechanism for a gun safe or lock box. In addition to a gun safe or lock box, we also recommend a second safety device on the gun itself to help prevent accidental shootings. Simply leaving the factory safety on the gun, while a good practice, is not enough. There are a few things on the market, as well as some recent or upcoming releases, worth looking at. 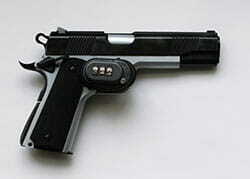 One option to consider is a trigger cover or lock which will make it difficult (though not impossible) for the trigger to be pulled until the cover is removed. A trigger cover can be a good guard against accidental firings of the gun in the house when you are removing your gun from its secured location. Styles range from very simple like a fabric cover (like this one on Amazon) to very sophisticated like the recently announced Identilock. Some even have combinations like a small safe like this one on Amazon. Many of these trigger covers snap or slide into place over the trigger and can easily be removed from the gun. The Identilock uses a fingerprint scanner as its release mechanism, which is both quick and extra secure. 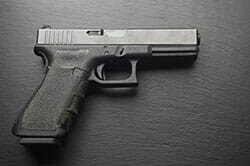 Another option is the cable lock or chamber lock, which locks through the chamber or into the barrel of the gun, preventing a round from loading into the gun and preventing ammunition from firing. These locks fit into the chamber itself (see one on Amazon), down the barrel of the gun (see one on Amazon), or through the chamber and lock with a padlock and key. These chamber locks are available for free in many states through your local police department in partnership with Project ChildSafe and their gun safety kit. 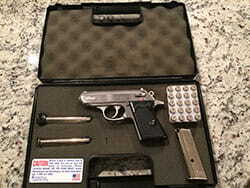 Generally the goal of smart guns or personalized firearms is that the gun will be coded to the person authorized to use them, either through biometrics, finger or palm print readings (think James Bond), trigger pressure or a device, usually a watch or ring, that enables the gun when it is in range. While these areas of research are exciting, there are currently no feasible options available to US customers, so we can’t make a recommendation on what to look for if you are interested in these kinds of firearms. But this is definitely an area of product development that A Secure Life will keep an eye on. Overall, finding a safe way to store your gun at home can be one of the most important life-saving measures you can take. 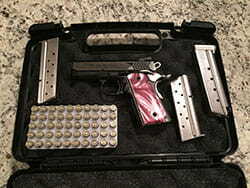 Whether it is keeping the gun away from intruders who will turn something meant for protection against you, or keeping the firearms out of the hands of young children who don’t know how to handle one safely, we encourage everyone who keeps a gun in the house or is considering doing so to carefully create the best gun safety plan for your situation.